By most measures, California has earned the right to brag about how much it has cleaned up its environmental act. The air in much of smog-shrouded Southern California has been scrubbed. A passenger car for sale here today is 99 percent cleaner than one in the early 1970s. The fossil fuels required to power the state’s economic engine have decreased by a third since their peak in 2001, while economic activity has expanded by an equal measure. In addition, California’s response to climate change is a one-of-a-kind hybrid, knitting together market-based programs such as the cap-and-trade system for reducing carbon dioxide and other harmful emissions; strict regulations to promote energy efficiency in buildings; and generous financial incentives for “green” projects. It’s working. California is poised to meet its goal to reduce greenhouse gases 33 percent, to 1990 levels, by the year 2020. Its targets for use of more renewable energy by that date are, in some cases, already exceeded. So take a bow, California; you’ve done the easy stuff. But hold on tight for what comes next. Emissions-reduction must hit 40 percent by 2030 and twice that by 2050. In 12 years, half the state’s energy must come from renewable sources such as wind and sun. California’s 14 million buildings must operate twice as efficiently, and the number of electric cars on the road will have to multiply more than 10 times. Failure would likely mean more extreme measures in later years and, many experts say, could affect public health. The scope of the state’s approach is all-encompassing. By law or executive order, every state agency must consider climate change when making any planning decision. Developers must take into account how far motorists travel to reach a destination, forests will be managed so that trees store more carbon dioxide and highway builders have to calculate the possibility that rising seas might inundate the roads. Normally upbeat officials are guarded about the prospects. The most difficult work begins with California’s single most polluting sector: transportation, which accounts for nearly half the state’s greenhouse-gas emissions. That will include cutting gasoline use in half, reducing the miles that car-centric Californians drive, dramatically ramping up the adoption of electric vehicles and building a network of readily available charging stations. But transportation emissions are produced largely outside the clutches of state regulation: think airplanes, trains, and ships. And technological change for heavy-duty and medium-duty trucks, buses and shuttles is sluggish, although adoption of all-electric municipal buses is growing as costs come down. Although California has decreed that auto manufacturers sell a percentage of zero-emission vehicles, there is no mandate that drivers purchase the pricey cars. Regulators and legislators have been reluctant to force consumers to buy them, as they have with TVs, heavy appliances and other products. That would change with legislation proposed by Assemblyman Phil Ting, a Democrat from San Francisco. Ting’s bill would ban the sale of gasoline-powered cars in California by 2040. The idea went nowhere when Ting proposed it last year, and its prospects now are unclear. Ting, who drives an electric car, said more access to charging stations would be transformational: There’s electricity nearly everywhere drivers park. 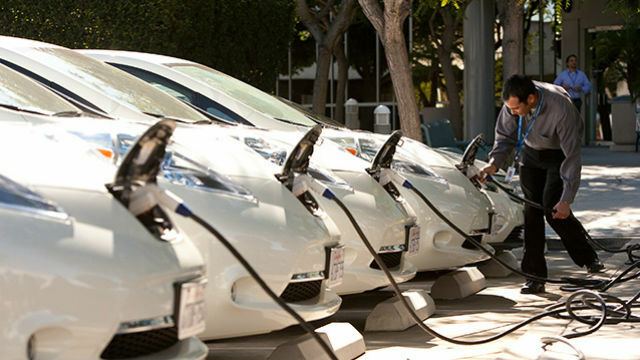 The California Energy Commission has tied together charging stations that trace a north-south, mainly coastal path. The task of attracting electric car buyers in Southern California and the Bay Area has been accomplished. The challenge now is engaging inland drivers, in places such as Bakersfield, Fresno and Redding. “We believe the private sector will take up the baton,” said John Kato, deputy director of the commission’s Fuels and Transportation Division, with automakers producing a wider variety of vehicles, across a broad price range, appealing to more buyers. One success story has been the state utilities’ swift integration of renewable energy into the state electric grid, partly because of a dramatic decline in the cost of solar energy. Emissions from power generated in the state fell by more than 19 percent last year, partly due to the ramping up of hydroelectric power with last year’s heavy rains. The Public Utilities Commission that regulates energy companies reports that they have met or will soon meet the 2020 targets. It will be more difficult to find further savings from existing energy-efficiency programs. The state is phasing out incandescent light bulbs, and the building codes for new construction continue to mandate efficiency. But still to be tackled is the thorny problem of retrofitting millions of old and outdated homes and businesses. With so many reductions required, the Air Resource Board’s post-2020 strategy is one element—a critical one—of the state’s multiagency approach to climate change. That strategy elevates the cap-and-trade system, in which companies can pay to pollute by buying credits, to a much more significant role. Cap and trade limits emissions on 80 percent of California’s polluters. The agency has never precisely quantified cap and trade’s contribution to greenhouse-gas reduction. Officials projected it at 17-20 percent in a planning document in 2008—a year before the program launched—but are unable to say if those assumptions have been borne out. Nonetheless, last month it adopted a plan that ups the ante: It forecasts that cap and trade, which lawmakers recently extended to 2030, will be responsible for nearly 40 percent of California’s emissions reductions by that time, a figure disputed by some as unrealistic. Some critics of the program say another factor could cause the state to miss its 2030 targets: the banking system that allows individual companies to hold tens of millions of carbon credits in reserve. According to separate analyses by the nonpartisan Legislative Analyst’s Office and independent economists, refineries, cement plants and other major polluters could produce emissions in the next decade that are well above the state’s ever-tightening limits and use their banked credits to offset their excess. Ross Brown, who analyzes cap and trade for the LAO, said in an interview that there’s a “decent to good chance” that banked credits could vault emissions to more than 30 percent over legal limits in 2030. Rajinder Sahota, who oversees the cap-and-trade program for the air board, said that although emissions may exceed the cap in any given year, the agency is confident the cumulative emissions between 2021 and 2030 will fall and California will meet its goals. Gov. Jerry Brown’s personal investment in California’s climate change policies has been a force multiplier, spurring state agencies and industries to adapt to the prospect of a carbon-less future. But Brown is in his final year in office, and the Legislature’s to-do list is crowded with other enormous issues, such as poverty and housing. This is an abridged version of the full story available at calmatters.org. CALmatters.org is a nonprofit, nonpartisan media venture explaining California policies and politics.